They exude a brash, youthful, arrogance and have a penchance for reeling off a string of impudent statements like "we're the only band in Britain who have something to say." They're the Blackwood-based foursome The Manic Street Preachers. Arrogant, idealistic, defiant, and with the aid of their 1977 tinged, fiercesome chainsaw rhythms, I predict The Preachers will soon be carving up column inches and receiving the rave reviews of admiring masses countrywide. How can I say this? Using the fickle music press as a guide and their cocky youthfulness as a yardstick you see that they've already achieved in six months what some bands take years to do. 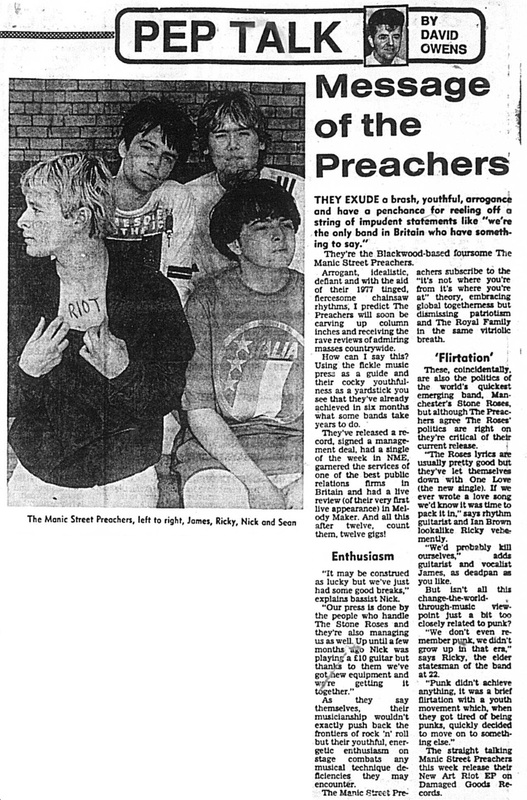 They've released a record, signed a management deal, had a single of the week in NME, garnered the services of one of the best public relations firms in Britain and had a live review (of their very first live appearance) in Melody Maker. And all this after twelve, count them, twelve gigs! "It may be construed as lucky but we've just had some good breaks," explains bassist Nick. "Our press is done by the people who handle The Stone Roses and they're also managing us as well. Up until a few months ago Nick was playing a £10 guitar but thanks to them we've got new equipment and we're getting it together." As they say themselves, their musicianship wouldn't exactly push back the frontiers of rock 'n' roll but their youthful, energetic enthusiasm on stage combats any musical technique deficiencies they may encounter. The Manic Street Preachers subscribe to the 'it's not where you're from it's where you're at' theory, embracing global togetherness but dismissing patriotism and The Royal Family in the same vitriolic breath. These, coincidentally, are also the politics of the world's quickest emerging band, Manchester's Stone Roses, but although The Preachers agree The Roses' politics are right on they're critical of their current release. "The Roses lyrics are usually pretty good but they've let themselves down with One Love (the new single). If we ever wrote a love song we'd know it was time to pack it in," says rhythm guitarist and Ian Brown lookalike Richey vehemently. "We'd probably kill ourselves," adds guitarist and vocalist James, as deadpan as you like. But isn't all this change-the-world-through-music viewpoint just a bit too closely related to punk? "We don't even remember punk, we didn't grow up in that era," says Richey, the elder statesman of the band at 22. "Punk didn't achieve anything, it was a brief flirtation with a youth movement which, when they got tired of being punks, quickly decided to move on to something else." The straight talking Manic Street Preachers this week release their New Art Riot EP on Damaged Records.